Foxwell NT520 - What’s New? Foxwell NT520 Pro – This is for those looking a decent car diagnostic tool for his/her own car(s), usually as personal use. 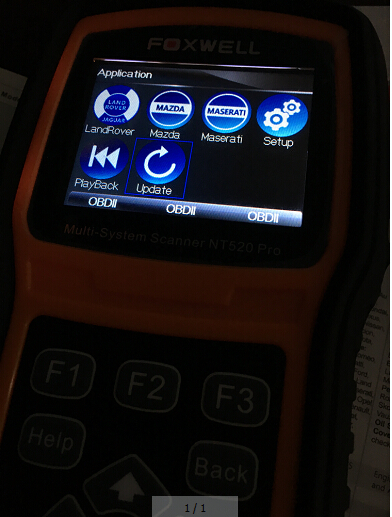 Why did I said NT520 (NT510) is good for personal diagnostic? Note that you can get ONLY 5 car brands software authorization with NT510, while you could get ALL software authorization with NT520 and install less than 5 programs on the NT520. Please delete the software you’re not using if you want another program. For example, if you have MB, VAG, GM, BMW, Volvo installed on your NT520, but now you need Ford software, you should remove one of programs you’ve installed and then install the Ford. It’s because the SD card storage limit will lead to bad user experience like running speed and also it’s necessary to leave some space for data recording in in diagnostic tests. NT510 is authorized with 5 programs at most. NT520 has no limit of software authorization, but 5 or less is better for a unit to install, for it can work well if with much software inside. “Update” is added to the new NT520 Foxwell, so you can connect the device by a USB cable with a laptop/PC to update, download and install software for use. You don’t need a card reader any more like NT510 update.